Mashboard is an app for your desktop and mobile device that brings information from all of your online services together in one place. Bridging the gap between your services makes the information more accessible, better organized, and searchable. Tap into your services with widgets designed to pull the type of information you’d like to see. You can even mash up similar information from multiple services into one widget. Want to see files stored on both your Drive and Dropbox accounts? 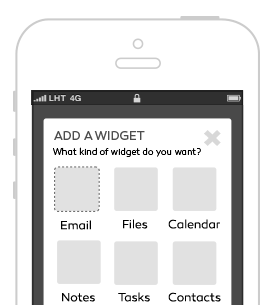 Just add a widget filter to pull files from folders on either service. Place widgets on your Mashboards to keep them organized and easily accessible. Group widgets of a similar topic by creating a Mashboard just for them. You’re in complete control so you decide what setup works best. 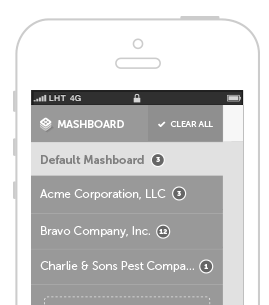 Search all of the widgets on your Mashboard to quickly find the information you need. You’ve added your widgets and filtered your data, but sometimes that isn’t enough. Each Mashboard you create can be searched to narrow down the information even further. It’s a real lifesaver if you’re in a time crunch. 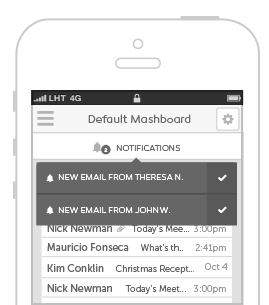 Stay one step ahead with notifications for the Web and your mobile device. Receive notifications that are worthy of your attention by adding notification rules to your widgets. 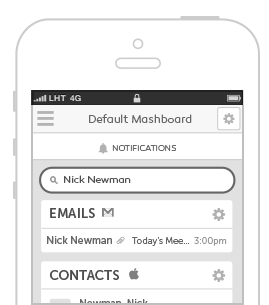 Mashboard will continuously monitor the widget’s services and only alert you when important information comes in.